New Delhi, Sep 08, 2017 : Gold prices surged by Rs 990 to Rs 31,350 per ten grams - its highest level in 10 months - at the bullion market on Friday in line with global markets. 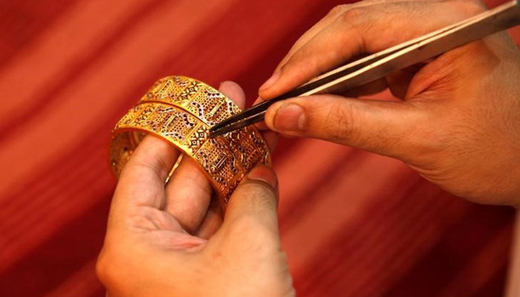 Besides, increased buying by local jewellers lifted gold prices to 10-month high. The precious metal had lost Rs 240 in last two days. At the Multi Commodity Exchange (MCX), gold for delivery in October was trading higher by Rs 98 or 0.32 percent at Rs 30,380 per 10 grams. Globally, gold hit its highest in over a year today as the dollar sagged after weaker-than-expected US jobs data and as festering tensions over North Korea stoked safe-haven demand. As per experts, sentiment got a boost after gold rallied to one-year high in global market as the dollar fell to its weakest level since 2015 in the backdrop of warnings that Hurricane Irma could have devastating impact on the US amid weaker-than-expected jobs data. Besides, simmering tension between North Korea and the US added to the uptrend. Spot gold was up 0.4 percent at USD 1,352.91. Earlier in the session, it marked its strongest since August last year. It was up over 2 percent for the week, on track for a third weekly gain. US gold futures for December delivery rose 0.7 percent to USD 1,359.50.